Let’s face it… We love our pet’s! But those pesky urine spots they leave on our beautiful oriental rugs can be quite troublesome. Pet urine is one of the worst stains that can occur to a rug. Thanks to our special urine treatment, and unique cleaning process, we have successfully cleaned hundreds of urine soaked rugs over the years. Stains are usually permanent, but we have had several occasions where we were able to completely remove the spotting. The odor, is a different issue. With our urine treatment, we have been successful in removing 90-100% on most rugs. But with rugs that have many stains that have not been attended to for a long period of time, it will more than likely be a a lingering issue, because the longer that urine sits in the rug fibers, the worse of an issue it will be for your rug and the flooring. Cotton, is very absorbent fiber. A large portion of wool rugs, have a cotton foundation. So when pet urine makes it’s way on to your rug, it will sit at the top of those fibers for a short time because wool has a natural repellent to moisture. This is a KEY opportunity for you to quickly blot the urine and minimize the damage. Once the urine make it’s way through the wool fibers it’s pulled into the cotton fibers in the foundation of the rug. So what seams to be a small visible stain on the surface, is really a large amount of urine inside the rug! We still love our pet’s! But urine stains are the WORST. Prolonging having your natural fiber rugs cleaned and urine treated can be detrimental to the health of your rug. Leading to problems such as permanent staining, dye bleed and color loss, and in some case’s dry rot! 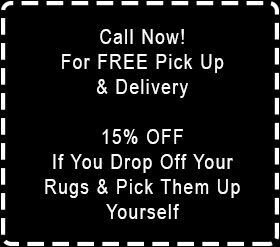 Call us for a quote and free pick up and delivery!